There have been numerous articles written about senior driving, however most of them have one thing in common — the overzealous desire to ensure that the independence of the senior citizen is preserved at any price. Many of these articles favor preserving the rights of seniors who may be compromised in their ability to drive. They are written by extremely caring geriatric care managers with degrees in social service, writing from their heart, but not necessarily weighing the risks involved. I call this the “bleeding heart” analysis, and frankly it’s dangerous. Here are a few simple facts. In our mobile society, it is certainly critical for seniors to be able to leave their homes to commute to shop, go to supermarkets, senior activities, church, etc. Mass transit is not always readily available, and due to budget constraints, bus services have been severely curtailed in many communities. Senior transportation services exist, but are often inconvenient or inaccessible and seniors do not necessarily have the disposable income to take taxis. These issues exist and there is no simple solution. As for family members, some may not live close by to their parents but may not be available to help. Sometimes, family members who do live close by may not want their lives disrupted by constantly having to drive relatives around. Although the issues are a problem for senior mobility, they fail to address the one reality that cannot be denied. 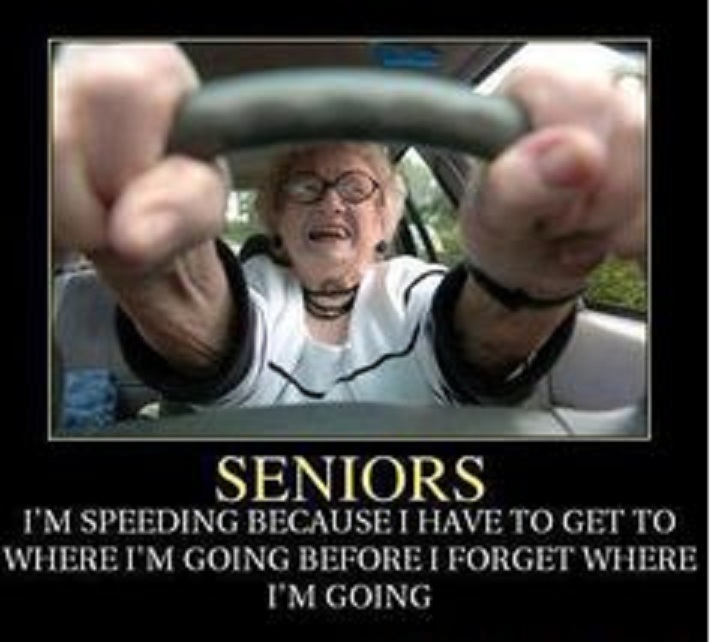 Seniors “do not want to admit that they are no longer able to drive safely” when their vision deteriorates or their reflexes are no longer adequate due to physical limitations. Seniors often do not recognize when early stage dementia has set in or choose not to admit it. They do not desire to give up their independence and be forced to rely on other people or services for transportation. Underlying all of these reasons is their fragile egos, where they focus solely on their needs and don’t see the risk that they present to others. The harsh reality is that every time that a senior with early stage dementia or severe disability sets foot in a vehicle, he or she is putting his or her life in danger and, more importantly, putting the life of innocent people at risk. To state this in simple terms, putting others lives in danger to preserve the fragile ego of the elderly is too high a price for society to pay. Two recent episodes with clients demonstrate the critical nature of this issue. Example 1: A senior citizen was whose only other family was an elderly sister, was driving down to the Jersey Shore to visit a friend. She exited the highway at the correct exit, but then had an episode. She could not remember where she was going. She become highly agitated and crashed the vehicle into the side of a retail building. An ambulance arrived and she was taken to a local hospital. Her car was towed to the police lot. In the end, she was transferred to a nursing home, where she remained for approximately one year until her passing a few months ago. Example 2: We had been working with a family for years. The mother had been in decline for some time with advanced dementia. On several occasions, she had left her home to go shopping and called a family member to tell them that she had gotten lost and could not remember the way home. We advised the family to “take away her keys” before she got into a serious accident or worse. The mother refused to relinquish her keys. She would not accept her dementia, insisted that she was fine and was not going to stop driving. The family lacked the fortitude to deal with the situation. Several weeks later, she was driving a few blocks from her house, lost control of the vehicle and crashed into a neighbor’s home, totaling the car. After this episode, she finally gave up driving! We could cite numerous other similar cases. The Division of Motor Vehicles is reluctant to revoke the license of a senior citizen because of the concern about age discrimination complaints from senior advocacy groups. The police may issue summons to senior citizens if laws are violated, but it has been my experience that police officers also feel uncomfortable in these situations. Even judges are lax in forcing senior citizens to retake a driver’s test. All of this is well and good, until there is a major accident involving a senior and a life is lost unnecessarily, a tragedy that could have been prevented. Children of seniors are reluctant advocates because they do not want to upset their parents for a variety of reasons. On the one hand, they sensitive to the loss of independence that their parents may be experiencing. They also may not wish to jeopardize any possible inheritance, not pleasant, but it’s a variable. They don’t want to alienate a parent, to incur their wrath, and risk damaging a wonderful, loving relationship. Children are also concerned that the burden will fall on them. So the children sit by and let nature take its course. And maybe after mom or dad has three accidents in a six -month period, the children will finally act. Or maybe they won’t! I know that this blog is not going to win any popularity contests with senior citizens. The truth often hurts, but it is still the truth! Yes, we need to improve the availability of alternative transportation in our communities for seniors. But in the meantime, we have to be cognizant of the problems with senior driving and be vigilant about protecting the lives of the innocent victims that may be on the other side of the road.